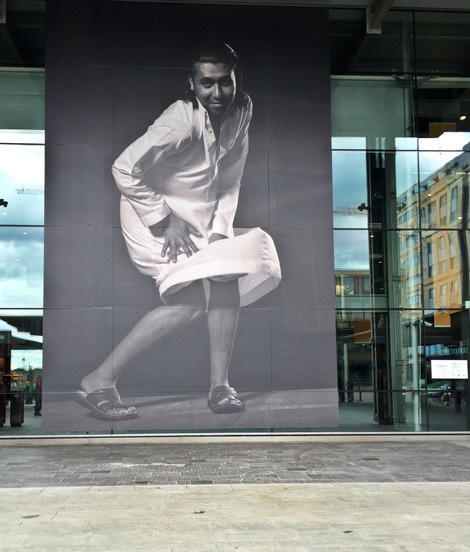 It´s a great pleasure to exhibit the art of Adel Abidin to a Norwegian audience for the first time, at Oslo Central Station and at Fotogalleriet. Making many references to popular culture, his works often have a humorous twist that allows us to see reality in new ways. His extensive use of familiar characters and scenes aids the interpretation of his works, as well as revealing the impact of cultural stereotypes. “I use my cross-cultural background - as an Iraqi artist living between Helsinki and Amman - to create a distinct visual language often laced with sarcasm and paradox, while maintaining an ultimately humanistic approach.“ says Adel Abidin. Cover-Up! is a play on the classic film scene in which Marilyn Monroe's white dress blows up in a gust of air. In Abidin’s video Monroe is replaced by an Arab man dressed in a traditional Middle Eastern white robe. The work questions society’s ideals of beauty, acceptance and tolerance. The work is presented both as an video installaion where viewers are invited to share the experience by stepping up onto the fan, and as a large scale photo on the façade of the Airport Express Terminal. Video installation: 11th of August - 22nd of September 2016. Large scale photo: 11th of August - 21st of November.